Two men, descendants of Italian immigrants, with their personal and family experience, their community activity and professional history, as well as their thoughts about their heritage and cultural roots and what they have done or plan to do to preserve them. Established in 1944 in New York City, the Columbus Citizens Foundation is one of the best known Italian-American organizations in the country, much respected both in the US and Italy. It includes nearly 600 prominent men and women of Italian heritage representing the fields of law, medicine, government, business, education, and the arts. The Foundation describes its mission as “perpetuating pride in our Italian-American heritage, contributing to charitable causes, and encouraging and supporting the educational goals of young people through our grant and scholarship programs.” And indeed, throughout the years, it has disbursed more than $12 million in scholarships, grants, and gifts to charitable organizations and worthy causes, irrespective of race, religion, or nationality. The general public, however, knows the Foundation primarily as the main organizer and sponsor of the Annual Columbus Day Parade, one of New York’s landmark events. Taking place on Columbus Day, the second Monday of October (a Federal Holiday since 1934 in the U.S.), the parade is viewed by millions both on Fifth Avenue and on television throughout the U.S. and abroad. The Parade, the Celebration of the Mass at the Cathedral of St. Patrick, and the Weekend Gala at the Waldorf Astoria are the main official events of Columbus Day. Furthermore, around this nucleus a number of independent events have developed over the years and are organized by the Italian and Italian-American community so that October has become, for all intents and purposes, the “Italian Month” in New York. 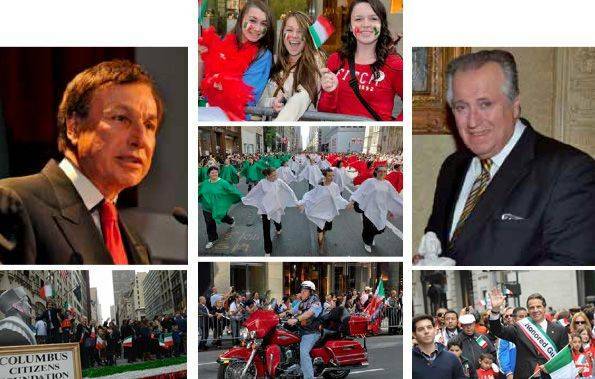 This issue of i-ItayNY proves this beyond a doubt, as you can see from our special insert dedicated to this year’s Italian Heritage and Culture Month. Sponsored by the Italian Heritage and Culture Committee of NY, Inc., the events listed in the insert extend from September to December, suggesting that the most Italian of American cities now actually has an Italian Fall (or even Fall-Winter) period. Here we introduce our readers to those who lead and manage the Columbus Citizens Foundation, Frank G. Fusaro and Angelo Vivolo. And, as it is customary in our approach, we present first of all two men, descendants of Italian immigrants, as well as the two highest ranking officials of the Foundation. We highlight their personal and family experience, their community activity and professional history, as well as their thoughts about their heritage and cultural roots and what they have done or plan to do to preserve them. And, with that said, we wish you, Buona lettura! Q: Let’s start with your ancestry. Where in Italy are your family origins? ANGELO VIVOLO: I am first generation Italian. My father was born outside of Naples in a town called Brusciano. When he and his family arrived in New York City they first stayed with some Italian friends in East Harlem, then they moved to Brooklyn, and eventually settled in Bensonhurst, where almost everybody was Italian. My mother, on the other hand, was born here from a family of Sicilian immigrants from Messina. They lived in Brooklyn too, and that is where she met my dad. He lived in the next house down from her. It’s also where I was born. Q: So you were both raised in a heavily Italian environment. What was growing up Italian in Brooklyn like? When did you realize how diverse America is? FUSARO: My father died when I was one year old. But because we had so many family members close by, I don’t remember wanting for anything. I always felt good about being Italian because everyone in my world was Italian. Then when I was eight my mother remarried and we moved into a more diverse neighborhood. It was there that I experienced ethnic diversity for the first time. VIVOLO: Everything in my life was Italian, since I lived above my grandfather’s Italian restaurant and everyone who worked there and patronized the restaurant were Italian. Food and festivities were always at the center of our family’s life because of the business we have been in till this day. Even Italian music was an important part of family life: my uncle would play the accordion and everyone thought they could sing. It was always fun. And mass every Sunday, of course, was mandatory. But we always knew that we lived in a multiethnic society … This may have been unique to us, since we were in the service industry and therefore exposed to other ethnicities over the years.Besides, when I went to school… that was not an all-Italian environment. VIVOLO: No. Most of my friends were Italians, of course, but I attended Lafayette High School, which at that time had a predo-minantly Jewish and Italian student body. I graduated from Long Island University, and that was a very multiethnic school too. Q: Have you ever experienced “ethnic frictions” or anti-Italian discrimination? VIVOLO: Not that I can remember. No, I never had that experience. Incidentally, in my senior year at college I was the President of that multiethnic student body. FUSARO: I did observe ethnic frictions between the Italians, Irish and Jews, but nothing very serious. I know many other ethnicities harbored anti-Italian feelings, but I never let that stop me from reaching my goals. Q: Do you speak Italian? How important is it for your goal to spread the knowledge of the mother tongue among Italian Americans? VIVOLO: My grandparents and my dad spoke Neapolitan and my mother’s parents spoke a very strong Sicilian dialect. I studied Italian in junior high, high school and college, and I can speak conversational Italian. Unfortunately, most schools do not offer Italian as a language option these days, and students are limited because of that. Other languages are viewed as more useful in general and of greater help to business students. As parents, we need to instill in our children that the Italian language is the centerpiece of our culture and heritage. With the recent addition of the AP Italian program, there is a better chance of that changing. FUSARO: Both my parents spoke fluent Italian, but with great sadness, I have to admit that like so many second generation Italian Americans I don’t speak the language. It is an all too common phenomenon. Our parents and grandparents were so focused on our being American that they let the language slip. It’s a great regret of mine. You feel somehow separated from your roots if you can’t speak the language. I think preserving the language is one of a number of things that should be done to preserve our heritage. However, that’s not an easy task. I believe that if all Italian-Americans who had never visited Italy (and you’d be amazed at how many there are!) were to take the time to understand and appreciate their heritage, it would be a giant step forward. Q: Speaking of Italy, when was the first time you went there? Have you ever visited your ancestral town? What was your first impression? FUSARO: I have probably made seven or eight trips to Italy, most recently two years ago when I had the honor of representing the Foundation at the dedication of a $200,000 vehicle that the Foundation donated to the relief effort in L’Aquila after the earthquake.The first trip opened my eyes to the amazing accomplishments of the Italian people. For me, it was a life-changer, and I’ve given over a hundred presentations to students, fellow Foundation members and others about the pride that we should take in being of Italian heritage. My first trip to Ischia made me wonder what made my grandparents leave that paradise for Brooklyn! The answer was simple: opportunity for their children at great personal sacrifice. VIVOLO: My first visit to Italy was 30 years ago, and I have been back many, many times since. But unfortunately I never visited my ancestral town, Brusciano. Q: What is the Columbus Foundation for you? How did you join and what are you most proud of? The Parade above all else is our opportunity to tell the world of the accomplishments of Italians and Italian Americans, and to thank those who came before us for all that they sacrificed in order to give their children the opportunity to succeed. Both Angelo and I are from what I call the blessed generation. Our parents never had the opportunities that were available to us. They educated us, instilled in us great values, and sent us out into the world to find our own way. But while I am very proud of the Parade, I am most proud of the generosity of our members, of having so many highly accomplished individuals give so much of themselves to the Foundation. So, there’s no question that our scholarship efforts are the single most important thing I am proud of. VIVOLO: When I was 31, I got married and moved to Manhattan where I settled in a non-Italian neighborhood. So after a few years, I joined the CCF because I wanted to expose my children to Italian Americans outside my immediate family. In fact, by participating in all the Foundation events, they learned a lot about our culture and heritage. After my first year at the CCF, I became a board member and served in that capacity under six different presidents, becoming more and more involved in the mission of the Foundation. Today, I am proud to be the President of an organization whose membership is dedicated to preserving and enhancing Italian culture and heritage through their philanthropic efforts. Our scholarship program for Italian-American students who have the ability but lack the financial means to receive an excellent education is second to none, and it demonstrates our commitment to give back to our community. These students are our future leaders. Q: Mr Fusaro, you have raised millions of dollars to treat Thalasimia, a children’s fatal blood disorder especially rampant in Southern Italy and other Mediterranean countries. This seems to be linked somehow to your Italian origins, am I correct? FUSARO: That’s correct. I learned of Thalasimia through members of the Foundation who had family members who were stricken with the disorder. I had no personal involvement, but when I saw the suffering of the children and parents, I could not turn away. Q: Mr. Vivolo, you ran four successful restaurants through the Vivolo Group. Your family is in the restaurant business and, as you said, through food, “Italianness” has always been an integral part of your life. You must feel like an “ambassador” of Italy in the NYC dining scene. How important is food to Italian lifestyle and culture, and to you? VIVOLO: I have owned and operated my restaurants for the past 38 years and feel that I have given the public an opportunity to experience a part of Italian culture through their dining experience. It piques their curiosity about Italy and all of the great products and traditions that led to the creation of our cuisine. On a personal note, as I said, my family traditions are embedded in food and what it represents. But in general, you may well say that food and dining are integral parts of our culture. First, the family table is essential to our social fabric. That’s where we engage in the interactions that reinforce our commitment to family values. Second, enjoying traditional food reminds us where we come from and that we are still a part of that great tradition, even if we were born and live outside of Italy. Q: As you mentioned, you were both born and raised in an all-Italian environment. What are the first words in Italian you remember, if any? FUSARO: Not fit to print! [smiles].